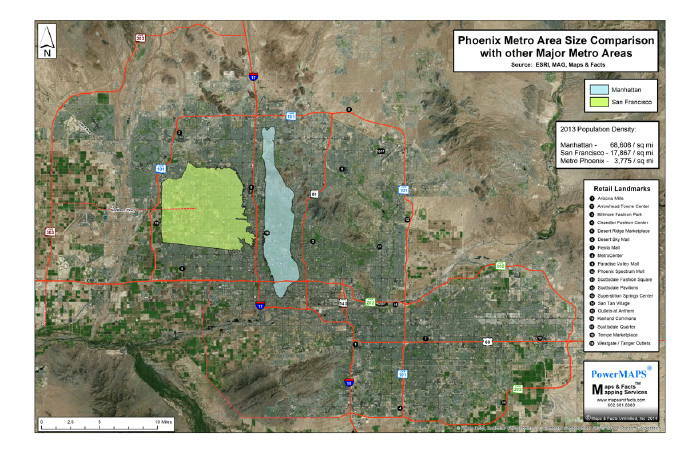 Map Samples - 2014 Maps of the Month - Maps & Facts Unlimited, Inc.
Central Phoenix Loses 10,510 People! 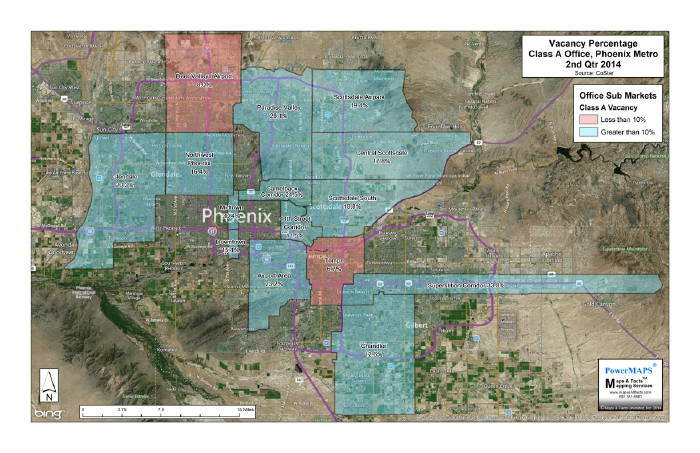 This month’s map takes a look at the 10 year population change in a 15 square mile area of central Phoenix based on the 2000 and 2010 US Census. By comparison, the City of Phoenix had an average population increase of 9.2%, or just under 1% per year during this time period. 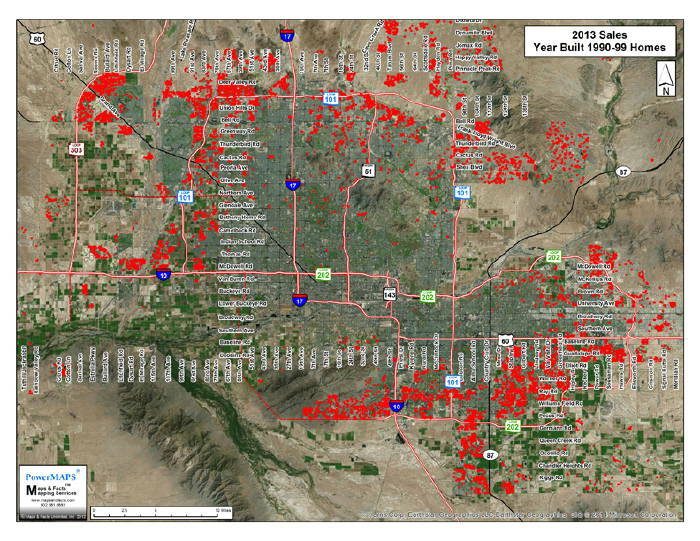 While individual tract changes are spotty and often the result of small numbers, there were 10,510 fewer people living in this area in 2010 than in 2000; even after the positive impacts of ASU, new condos, and new apartments along Central Avenue were added to inventory. 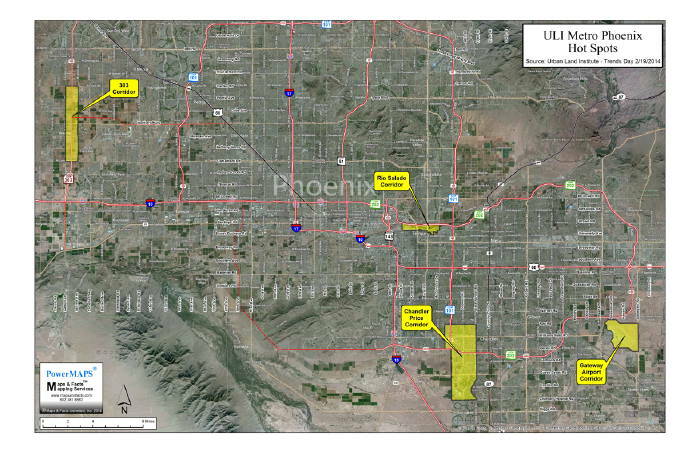 ULI's Metro Phoenix Hot Spots! We attended another outstanding ULI (Urban Land Institute) Trends Day on the 19th. One takeaway was a panel discussion of Hot Spots in Metro Phoenix (four in Phoenix and 1 in Tucson). The four Phoenix corridors are depicted on this month’s map. While each corridor is different, the common theme was their evolving “sense of place”. From what we can tell, there are more new restaurants per square mile in Downtown Phoenix than anywhere in Metro Phoenix! 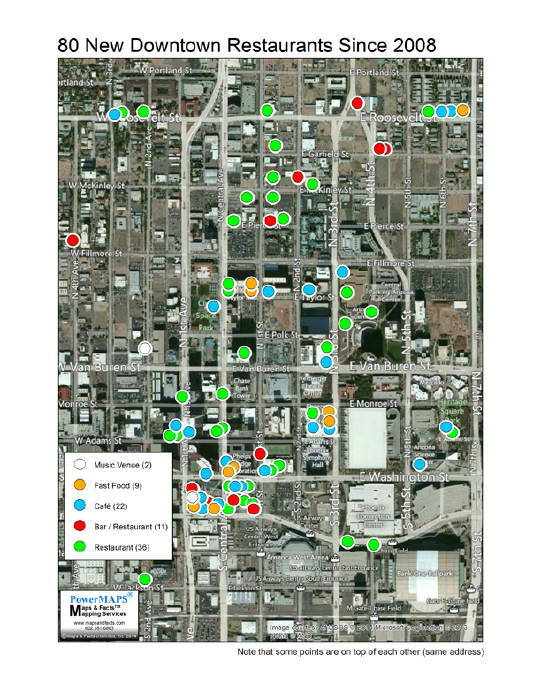 With our thanks to Dan Klocke, VP of The Downtown Phoenix Partnership, this month’s map shows the approximate locations and dining options for the 80 new restaurants that have opened in Downtown since 2008. Now that there is more talk and some new projects are under way, Trade Areas matter once again. Maps & Facts has long endorsed True Trade Areas vs. Rings (July 2008 & April 2012). 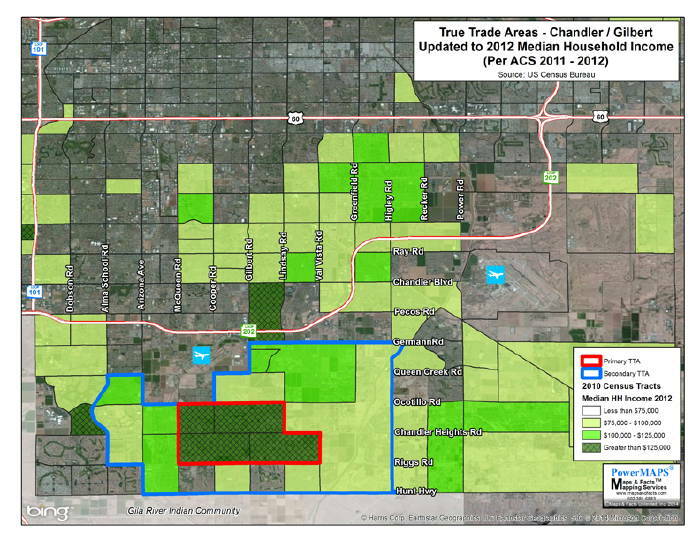 This month’s Map highlights a sample True Trade Area based on Median Household Income. Let the data show the Trade Area, not the geography. As this month’s Map shows, both the Primary and Secondary trade areas are meaningful polygons, not rings. ie: a 3 or 5 mile ring would include parts of the Gila River Indian Community! Depending on traffic patterns, the Tertiary Trade Area could extend to the North or East. School performance can be a proxy for commercial real estate including land values, rents, highest & best use, absorption, occupancy, demand, and more. 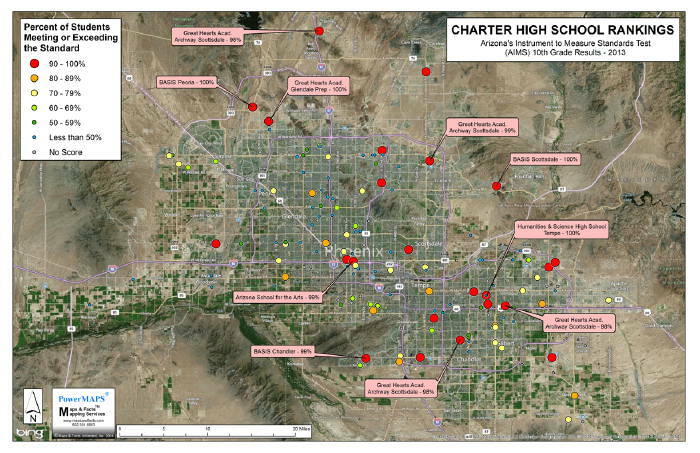 This month’s map depicts the results for all 141 Charter Schools which administered and reported10th Grade AIMS Test scores in 2013. The scores shown are size and color coded by percentiles with the top 10 schools called out. While Charter schools are purposely individualistic, 63 of the 141 schools scored below 50%. The 2013 sales are plotted on the map below. As the above indicates, the “average” Metro Phoenix median house price is now back to where it was in 2008, and, the first half of 2005. It is also interesting to compare the number of sales for this data set; compare 2005 with 2013. What happened between 2005 and 2013? Ask your favorite economist! 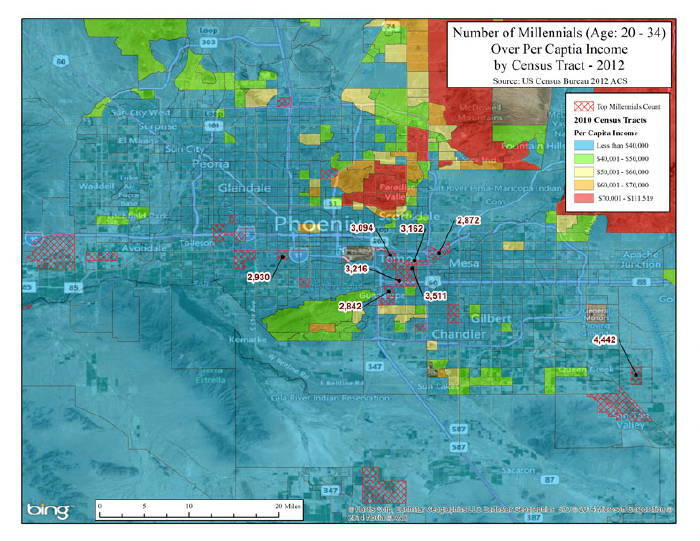 Interestingly, those census tracts with the most Millennials also have per capita incomes below $40,000 which poses the question: “Why Millennials?” There aren’t that many Millennials in Phoenix and from what the census data indicates, few have high discretionary incomes. Maybe retail has been targeting the wrong demographic? In August, the most exciting thing that happens in Phoenix is the state Department of Education's release of the latest AIMS (Arizona Instrument to Measure Standards) test scores. This month's map compares the 2014 test scores with the 2013 test scores for the 5th grade test takers. The top 10 with the largest positive change schools are shown in red. The bottom 10 with the largest negative change are shown in blue. Their respective changes are summarized in the accompanying chart. We compared the scores for 472 elementary schools based attendance boundaries. Of the 472 schools 245, or 52%, remained within +/- 10% of their 2013 test scores. One Hundred and twenty two (122) schools, or 26%, exceeded 2013 by 10% or more. Unfortunately, 103 schools, or 22%, scored lower in 2014 by 10% or more. Maps & Facts Uses an Average of "Meeting" or Exceeding" the "Standard", or what the Arizona Department of Education indicates as "Passing", for Reading, Writing, and Math for 5th Grade Public School Students. While valley wide, Class A office vacancy rates are declining i.e. from 26% in 2010, the peak, to 17.7% in 2Q 2014, they are still significantly higher than the under 10% lows in 1999; 15 years ago! Ten (10) percent is the vacancy rate generally considered necessary to justify new construction and positive absorption. This month's map shows Class A office vacancy rates by CoStar submarket as of second quarter 2014 for those submarkets with at least 5 Class A office buildings. As shown, of the submarkets studied, only Tempe and Deer Valley/Airport are now below 10%; at 6.7% and 8% respectively. 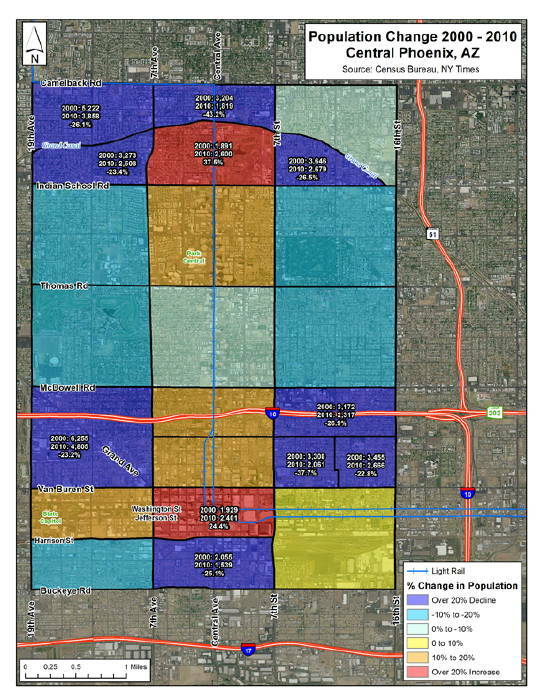 Scottsdale South and the 44th Street Corridor have made dramatic improvement and are at 10.8 % and 11.5% respectively. However, a low vacancy rate doesn't necessarily mean it's time to order Champagne and break ground. Historically, in 1999 Class A office rents were about $25/SF; in 2007 about $35.00/SF (the peak); in 2010 about $24.50/SF; and, in 2014 $24.50/SF. Obviously effective rents are and were lower, but sub 10% vacancy may not be enough to restart the Class A office engine. Net effective rents will have to increase first; a lot. Single Family Infill is Back! 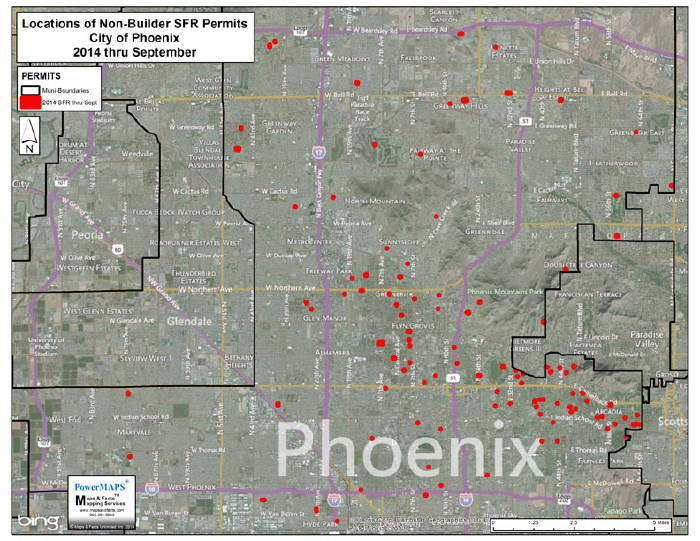 According to City of Phoenix records, only 1,285 new building permits were issued from January 1 through Sept 30. 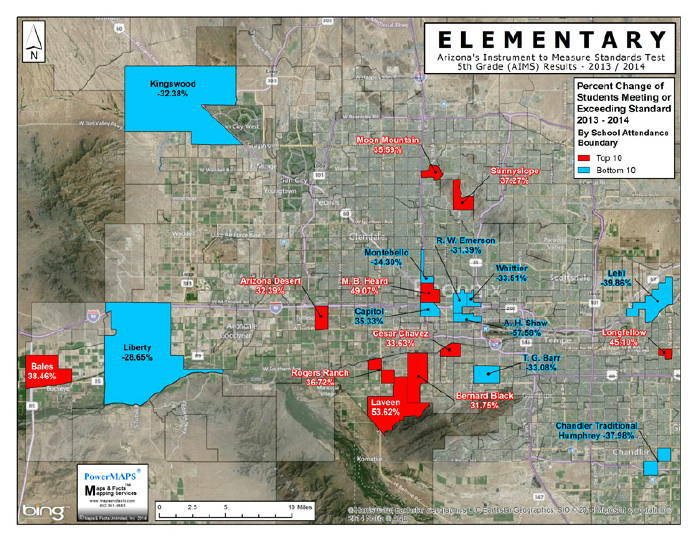 After mapping, and not unexpectedly, we found clusters in the northern part of Phoenix near I-17 & Happy Valley Rd / Cave Creek Rd & Carefree Hwy, and, in the southern part around South Mountain. More interesting however were the one- off (non-merchant builder) “infill” clusters comprising the older and closer-in neighborhoods of North Central Phoenix and Arcadia. As shown, these mature but pricy neighborhoods, blessed with good public, private, and charter schools, large lots, and location are finally justifying new single family construction; including many tear-downs. Hopefully, this indicates that after 7 years “cost new equals value” (appraiser talk); at least in some older sub- markets? Our January 2010 Map of the Month compared the densities of New York City, San Francisco, and Metro Phoenix. While densities have increased slightly i.e. New York’s population 2.53%; San Francisco 4.0%; and Phoenix by 3.34%, the message is the same. As Phoenix emerges from the Great Recession we need to look in the rearview mirror and be realistic about density and absorption. Phoenix is not New York or San Francisco. Good News! AZ Growing Faster than U.S. This month we would like to share (plagiarize!) the good news presented by Dr. Lee McPheters at the December 3rd ASU/Chase Economic Forecast. Bottom line: AZ employment, personal income, and population growth are all slightly higher than the US. The laggard is job growth at 2% as compared with Arizona’s 30 year average of 4.2%. While U.S. job growth has fully recovered from the January 2008 peak; based on the October 2007 AZ peak, AZ has only regained 69% of lost jobs and Metro Phoenix only 75%. In spite of the slow jobs recovery, for 2014 to date, Arizona ranks 12th in the country. 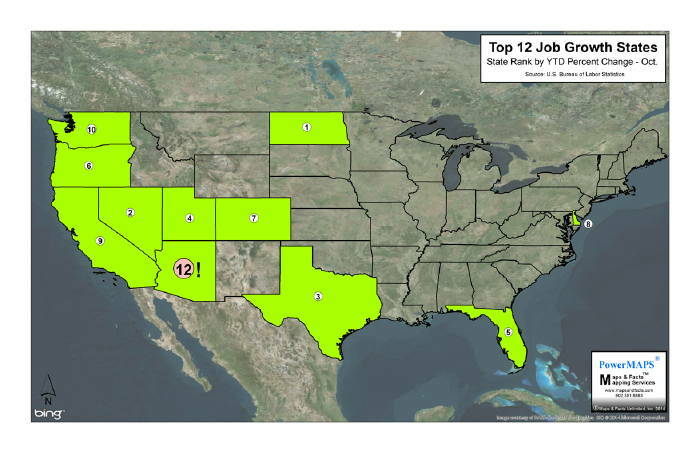 This month’s map, based on the US Bureau of Labor Statistics as presented by Dr. McPheters, shows the top 12 job growth states.